As founders of Career Meets Life, Sahar Nasseri and Mike Cook, began planning for their own futures and discussing business ideas that would support their personal situations, they eventually realized that there was a largely neglected market of people looking for flexible options. In short, they said, “job searching needed an overhaul”. And so they conceived the CML platform to “put professionals in the driver’s seat with more creative room to direct their career paths” by allowing job seekers to create anonymous profiles that employers can browse. Career Meets Life primarily targets job seekers who are employed and are open to better opportunities but wish to look for something new without broadcasting it to their current employers and colleagues. But you don’t need to be employed to use the site. Nasseri and Cook also developed CML to serve professionals whose personal situations may require more flexible work terms as well as professionals who have résumé gaps that prevent them from applying for great positions – or whose gaps are a barrier to re-entry. 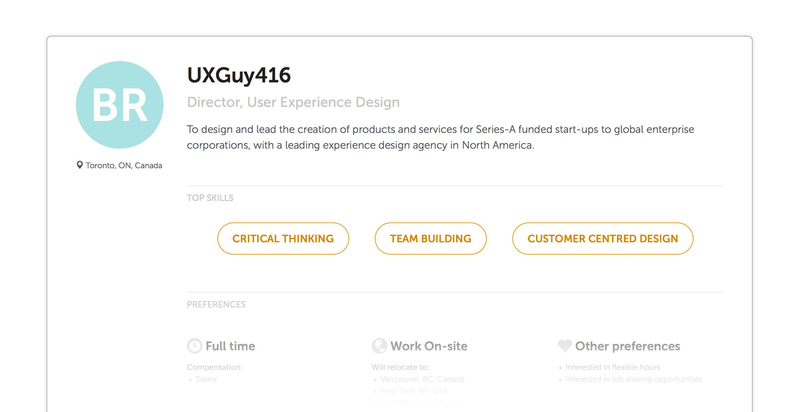 Job seekers first need to create a profile with titles indicating their expertise (e.g. Market Research Extraordinaire), skills and experience, work term preferences (flexible hours, location etc. ), and personality (what motivates you at work, interests, passions etc.). Once a job seeker’s profile is complete, employers can then find it in their search for candidates. Candidates are notified when their profile is viewed or a job prospect is awaiting their response. And when an employer shows interest and offers to connect, it’s up to candidates to decide if they wish to reveal their full profile with their detailed job history and contact information. If it’s not the right fit, the candidate declines to connect and remains anonymous. Because Career Meets Life is still in beta, employers can use it for free but need to request an invitation. CML tries to change the hiring process online for both employers and job seekers. Typically, employers use job board sites like Monster.com to post job ads that receive hundreds of applications. Not only are these sites expensive to use, employers are in no way guaranteed desirable candidates will turn up. CML, on the other hand, takes the reverse approach. Instead of hoping great candidates apply and are honest about their fit for the role and organization, employers can make more confident hiring decisions by browsing CML’s pool of candidates. Why? Because candidates are more likely to state their goals and preferences candidly when their profiles are anonymous. But also because there’s no longer this system where candidates can change their profiles to fit a job ad’s desired profile, they may as well state what they actually want. There’s no guarantee here either, but the system seems to lend itself better to finding good fits. And the anonymous bit is important. The initial idea was that anonymous profiles allow professionals to present themselves as they really wish without risk of exposure or repercussions in their current jobs (the trouble with LinkedIn). But it also helps build confidence and combat résumé bias for those with résumé gaps or non-traditional profiles or preferences. Plus, anonymity aims to provide employers with more reliable information. So in theory, it appears to be win-win. In reality, we’ll have to wait and see if it actually achieves any of this – which brings us to the main concern. While it seems like CML could fill a real need in a broken system, the best thing about CML may also be the riskiest. CML is trying to replace the traditional linear résumé with a “career story” model, yes? This means instead of listing your professional experiences by title chronologically, your CML profile tries to present a holistic picture of a person. It highlights a candidate’s top skills and relevant experiences related to those skills, states work term preferences and shows some personality as well. It’s risky, because CML’s success pends on user acquisition of both employers and job seekers. The company’s business model relies entirely on employers for now, where it’s free for job seekers and free for employers to search for candidates. Only when employers request a connection do they pay for the privilege. But without a large pool of candidates to search, employers won’t have any reason to join – and vice versa. So both groups need to embrace it if it’s going to work. Fortunately for CML, it seems likely that most job seekers would embrace a new approach, because many stand to benefit. Say, those who have previously experienced barriers to entry into the job market after taking time off to raise a family. Or who have gaps in their work history because of unemployment and a tough economy. Or maybe who are immigrants whose credentials are belittled or unrecognized. Such a model recognizes that life happens and values people with less traditional paths – it tries to level the playing field a little. That said, once an employer offers to connect and a candidate accepts, employers can view the candidate’s full profile, which includes detailed work history and education. So the benefits of the “career story” model may not carry some non-traditional candidates past this stage. But in the end, it’s clear that CML is a company that is trying to offer a solution to real problems. Let’s hope job seekers and employers are smart enough to get on board.